Gone are the days wherein the government thinks of cryptocurrency as a “bogus” economy wherein it is not considered to be at “par” with Fiat currencies. Today, government agencies are starting to tax people that have crypto assets. This is good and bad at the same time. Good thing is that some governments are now slowly accepting the fact that crypto is a legitimate source of income and a real currency, to begin with. The bad thing is that the number of trades that a high-level trader goes through and has gone through is so high that it would be nearly impossible to calculate everything within a few hours. It is possible to calculate all the taxable income made by a crypto trader but it will take a lot of time if done manually; time that should have been used to earn more money. Today, we will be talking about one of the websites that provides taxation services; known as Cryptotrader.tax. We will look into the website and show you guys what they are made of in general, learn what exchanges they support and what features they have that will help a trader get rid of crypto-taxation problems. In order to create an account, of course, we need to head on to their website Cryptotrader.tax and click on the “Get Started” button located on the upper right-hand side of the homepage. 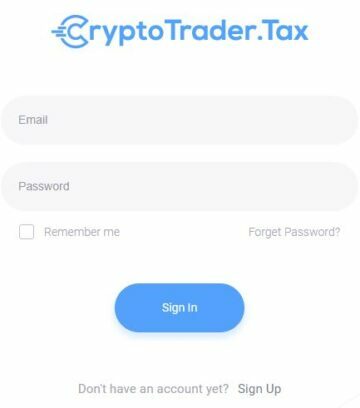 To create an account all you need is an active email and password for the new account that you will be creating under Cryptotrader.tax. The account creation process is really fast and no confirmation is needed in order to log into your account that literally takes just seconds after confirming your email address and password. There are different account types that users will be able to choose from aside from the free account that you will initially get. 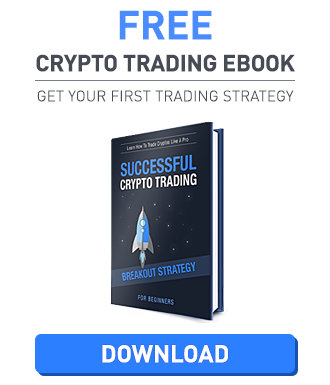 The default account (Free Account) comes with up to 25 trades per report, support for all crypto assets, FIFO Calculation mode, and manual trade imports. Going two notches higher we’ve got the Crypto Trader and High Volume Trader premium accounts. They cost $25 (Crypto Trader) and $45 (High Volume Trader) and come with up to 10,000 trades per report. 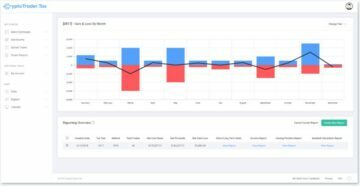 Both of these premium membership plans have unlimited reports, crypto asset support, but has multiple calculation modes paired with automatic exchange imports. After account creation, you will be redirected to the “Select Exchanges” tab located on the left-hand side corner of the account page. The supported website list includes Binance, Bittrex, Bitfinex, Coinbase, Gdax, Gemini, Kraken, and Poloniex. The mentioned supported websites have their respective guides on how to export all the exchange trading history making it easier for users to transfer files from one website to another. This is one of their amazing features which will be fully discussed later in this review. The platform itself wherein users will be able to import data from exchange websites isn’t that hard to figure out. The design is simple and makes it easier for even first-timers to know what to click with the help of their intuitive help instructions. On the left-hand side of the account page we have the “Select Exchanges” tab along with Add Income, Update Trades and Reports. Additional tabs include the “My Account” tab, Data Tools, and the Help and Support tabs. Shown in the screenshot is what you will be seeing first on an account that has not started using their services yet. To start, the user just needs to click the “Select Exchanges” button and this will open up a separate page wherein the user needs to choose the appropriate exchanges that need to be tax-calculated. Uploaded data will show up on the lower bottom of user trades for easier access and visuals. Unlike some of the crypto tax service websites today, Cryptotrader’s design is intuitive! Even a person that doesn’t have any idea of what their website is all about will surely figure it out within a couple of minutes they visit the website. Another thing to take note is that their website does not have any latency issues so going around each tab doesn’t take that much effort as well. Mentioned earlier the website provides an awesome guide on how to transfer data from exchange websites to Cryptotrader.tax with little to no effort at all. Aside from the easy to follow guides provided by their supported exchange websites, they also provide a Create Report Guide to top it all off. Cryptotrader.tax also provides the ability for a user to download their IRS Form 8949 with a detailed help guide. Users and visitors alike will also be able to read through their awesome blogs about cryptocurrency and taxes through this link. Affiliate Program – There is also an affiliate program that is quite generous for people that are willing to invite their family and friends. The referrer will receive $10 each per person that you invite that purchases a tax report plan. To start earning by inviting friends, all you need to do is to click this link. Customer support provided include Getting Started Guides, Common Issues, FAQ’s and a ticketing system that runs through Zendesk. It would have been much better if they listed out a number but they do not provide phone support. We would just like to emphasize how important it is to know how to contact the people that will be handling sensitive information especially when it comes to tax matters. Cryptotrader.tax does not have all channels ready to take care of their customer issues but they do have enough to make sure that people will be able to contact them. Cryptotrader.tax is a website that offers nothing out of the ordinary but provides a straightforward service. The only problem we encountered was figuring out of the website provided free services because their premium account options are hidden from plain sight. This is both welcoming and frustrating at the same time. Newly registered account owners will not be afraid to explore the website and its services due to the un-restricted feel that they get with the free account. All-in-all, the website provides a solid service that a lot of people looking for crypto tax services will appreciate.